No two operas in the repertory are more strongly associated with one another and performed on a bill together as often as Cavalleria Rusticana and Pagliacci, so much so that cognoscenti refer to them jointly as Cav/Pag. Conveniently, they are of about equal length, and together, they constitute a grand evening of grand opera. But more than that, when composed in the early 1890’s, they represented the forefront of a new genre, opera verismo. Their dramatic tone, themes, social context, religious observance, and musical character are so similar, they seem made for each other, as if by the same composer. Their settings even share a near common geography, separated only by the Straits of Messina. Cavalleria Rusticana takes place in Sicily, while Pagliacci is set in the deep south of Italy’s boot, Calabria. The roots of revenge that run deep in those peasant societies manifest themselves in both operas. 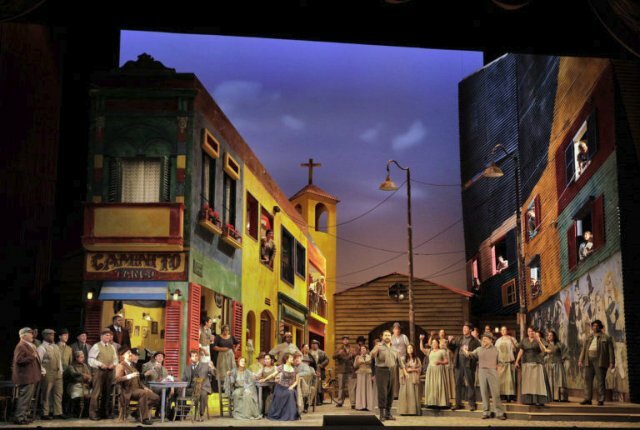 Director Jose Cura takes license with the locales of the opera, choosing the single setting of La Boca in Buenos Aires for both. Surprise – Cura is from Buenos Aires. The La Boca district of the city was the destination of many immigrants from the regions of the two operas (including my own maternal great-uncle from Sicily!). And although Sicily’s and Calabria’s towns are overwhelmingly sun-bleached, light-colored stucco, the big blocks of bright colors common in La Boca and in the opera’s striking set do exist in a few seaside towns in Sicily. The set even reproduces a garish, primitive styled mural from La Boca with characters from a traveling circus. A final harmonious tie-in with the relocation is the symphonic interlude from Cavalleria that allows inserting a couple dancing the tango, which was born in La Boca. Surprisingly, it has been 15 years since San Francisco Opera has produced Cav/Pag, so one is forgiven if the music is not fresh in the memory. Cavalleria is a simple story of jilted lovers, illicit affairs, and revenge. The lyrical, romantic music strains early in the opera give way to more religious motifs and ultimately to the dramatic dark realism of tragedy. At many junctures, one may reflect on the particular beauty of the music in the previous section. The same thought might occur at other intervals throughout. But in the end comes the realization that this score tantalizes the ear from the first note to the last with a consistency that few operas can match. Casting of the key parts could not be better. As the scorned Santuzza, Ekaterina Semenchuk delivers a masterful performance. This is a bold, commanding mezzo role that suits her completely. Semechuk powers through it vocally and dramatically in a tour de force. Roberto Aronica is Turiddu, and even if you didn’t see his bio, you would know that he is an Italian tenor, at least in musical affect. His lilt, somewhat akin to a slight country twang in American music, totally fits the disposition of a Sicilian lover. This whole production sizzles, and the bright colors of the set render a magnetic appeal that is missing in conventional drab interpretations. One serious criticism is that the opening numbers, Turiddu’s charming siciliana, “Oh, Lola” and the villagers’ chorus “Gli aranci olezzano sui verdi margini” are sung from off stage. That technique is appropriate, but the volume was so low that the audience first strained to hear, and in time, scattered rustling occurred. These are beautiful pieces that should be heard. The orchestra follows with a powerful and beautifully lush sound, but with such a volume increase that it jars rather than contrasts as intended. Pagliacci concerns the always anticipated event of a traveling circus troupe performing in a small town. Intrigues unfold among the performers and with the town’s people. Presented as a play-within-a-play, it centers on a lover’s torment and revenge over betrayal. Probably the better-known of the two operas on the bill, its fame rests largely on the crossover popularity of Canio’s lament “Vesti la giuba” and the universality of the clown theme. Many opera lovers are also familiar with Tonio’s prologue, which notes that the comedy is about real people and that the actors themselves are real. In essence, the message frames the idiom of opera verismo. In this opera, also well produced, soprano Lianna Haroutounian stands out as Nedda in a story that could easily be named “Everybody Loves Nedda.” Despite Pagliacci’s brevity, singing time of its male leads is spread among four principals, so that each has at least one highlight, but none is well developed. Canio is the most significant, and Marco Berti delivers his lament impressively. But his character seems forever distant as he wears a full face mask, and when he removes it, he remains in white face. Not merely presented sequentially, this Cav/Pag actually integrates some elements of one into the other and adds some connective tissue, resulting in a unified offering. Some singing characters from one opera appear in non-singing roles in the other, and the composers of both operas, Mascagni for Cavalleria and Leoncavallo for Pagliacci appear, without being identified. Unfortunately, these clever innovations are disclosed in the program summary but not in the supertitles. These adaptations add value, but it behooves the producer to alert viewers appropriately so that they can fully appreciate them rather than suffer confusion. In an unusual alteration, perhaps opera’s most famous closing line, “La commedia è finita” which is written for Canio, is spoken by Mamma Lucia, who is a character from Cavalleria. This change is the most explicit link between the two operas, and it also suggests that the speaker represents humanity, demanding an end to the destructive chaos of primitive morality evidenced in both pieces. Most any professional production of Cav/Pag makes for compelling opera. This particular one excites in every aspect. Hopefully, it won’t be another 15 years before these two gems return to San Francisco Opera. Cavalleria Rusticana, composed by Pietro Mascagni with libretto by Giovanni Targioni-Tozzetti and Guido Menasci, and Pagliacci, with music and libretto by Ruggero Leoncavallo, are produced by San Francisco Opera and play at the War Memorial Opera House, 301 Van Ness Ave., San Francisco, CA through September 30, 2018.